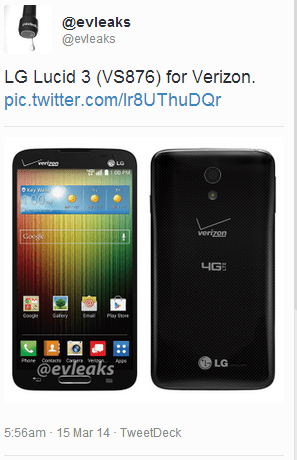 LG Electronics is expected to bring this year to the market a Verizon wireless device in a form of the LG Lucid 3, which is originally a South Korean mobile phone. About an hour ago, the smartphone has emerged online in a leaked photo, available to the infamous tipster @evleaks, providing us with the possibility to learn a bit more on what it will look like when brought to the states. Unfortunately, their is no information on what the device might have to offer in terms of hardware specifications. Based on what LG has done in the past with their smartphone features and capabilities on the Lucid 2, I can expect the new phone to be launched as a mid-range smartphone, though with pretty appealing specs inside [better processor and maybe a new OS].